In which I collate everything I’ve written about this year’s Academy Awards, and then present you with a singularly weird column. Previews: Can American Hustle really win Best Picture? | Martin Scorsese and the men who shouldn’t beat him for Best Director. | Will Leonardo DiCaprio break his Oscar jinx for Best Actor? 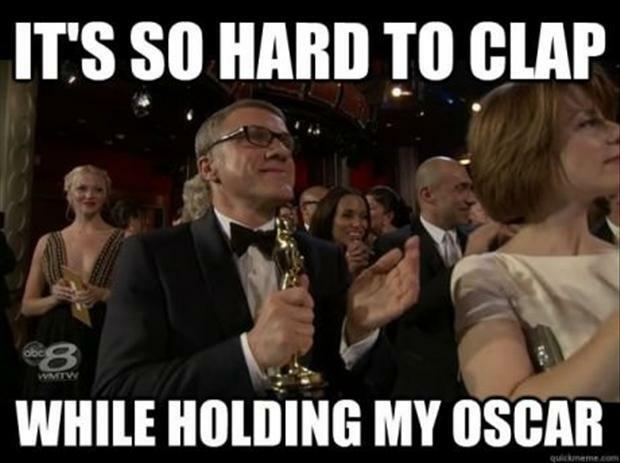 | Will controversy cost Cate Blanchett her Best Actress award? | Will Bradley Cooper score a Best Supporting Actor upset over Jared Leto? | Can even Jennifer Lawrence dethrone Lupito Nyong’o to take Best Supporting Actress? Here, in nine sections, are nine stories depicting the Awards this year, but each written in the style of the nine Best Picture nominees. (Follow the links in case you aren’t sure which nominated film is being referenced.) Because what better way to celebrate the Oscars than looking through the very eyes of the movies we’ve lauded this year? He should never have upgraded the teleprompter. Sure, it could now do a lot more, including write jokes itself, albeit a little stilted. It was too easily amused, too eager to laugh at its own feeble gags. But still, the fact that it — she — could now think on its own? Wow. That said, the teleprompter was getting too clever; he suspected she had learned to drink and now, during the Oscar telecast, was a dangerously sloshed scoreboard. She wickedly kept blinking, making almost every single presenter fumble and mix up words, and what she did to that poor boy from Grease was far too mean. The old man shuffled toward the auditorium, steady yet half-limping. His lovely daughter told him it was all a scam, that the Academy would never let him win, but the old man pointed to his Cannes trophy for Best Actor and asked her to believe. Damned Academy sweepstakes, she grumbled, deciding to humor her dad one more time — so he could comment on how unfinished the montages looked and sit there while some former-comedian made faces at him. Angelina missed her child. She rattled on and on to the nice but uncaring journalist in earshot and he gradually felt her pain as she gazed wistfully at Lupita Nyong’o. She’ll never be able to deal with adopting a kid that good-looking, felt the journalist, but still, look at the old heroine wear the smile. It’s kinda brave. He found himself warming to her, and the two became friends — but hark, there is pleasant news at the end of the night for Angelina after all! Her husband just brought home a bright, golden son. Harrison Ford heard the music — the theme music from those movies where he had the whip and the fedora, or was it the movie with the guy in the black mask? — and walked towards the centre of the stage. But just as he started to talk, he lost contact and could feel himself float away. Maybe it was the acid Jim Carrey had slipped him, maybe it was the really, really loud background score; but here he was floating away like Major Tom. Even the girl that hosted the awards was beginning to look like Barbarella to the spaced-out Ford; he decided to quickly read all he could see on the weird, too-fast teleprompter and make a run for it. Captain DeGeneres, who hosted shows for a living, thought the Oscars would be just another quick, easy trip. But then she was taken hostage and the instructions appeared clear: no sudden laughs, no good gags, nothing at all that anyone might consider clever. She sighed and awkwardly tried to laugh at Barkhad Abdi and Jennifer Lawrence, both of whom — aware of the hostage situation — flashed back rictus grins. Finally, Captain DeGeneres hit upon a plan: she bought everyone a round of pizza. It’s all about the chest-thump, he explained to Leonardo DiCaprio. DiCaprio went on a charm offensive, trying to be the nicest, smiliest guy, in his quest to finally win what would be a very well-deserved award. The chest-thumper, on the other hand, kept thumping his chest and banging for more — more, with Mud, more with Dallas Buyers Club, more with The Wolf Of Wall Street and more still with True Detective. The voters didn’t have an option but to be impressed. 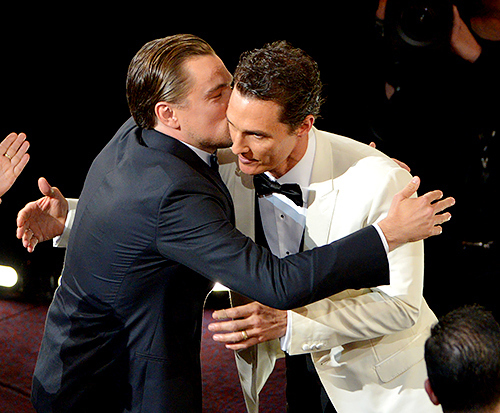 Always keep chasing, he said when he won, thumping his chest once as DiCaprio watched from the front row. The voter wanted to make a difference. He wanted to reward the smartest, the cleverest, the most original new cinema. But the Academy had tightened its iron-vice around his opinion; they thought a certain way, he was but a cog. He had to conform. He had to give in and applaud movies that are laughed at for being obvious Oscar-bait; he had to stand and play the fiddle while Inside Llewyn Davis, Short Term 12 and Frances Ha were brutally shunted out. He had no choice but to look at Brad Pitt as if he were the messiah. But all he really wanted was a bar of hope. Dear Mr. Sen, I normally agree with your reviews..However, as far as Queen is concerned, I have a difference of opinion, which I thought must not go unexpressed. Yes Kangana’s acting in the film, sets a new set of standards to be caught up with, and it has some brilliant conceptualization of some scenes.But I am not sure, if that is enough to get a film 4 star rating…To begin with I did not find Rajkumar Rao’s character logical enough. Can somebody sway back just by a glamorous picture..of ex fiancee..Rani’s father does get moved ( pun intended) by Vijaylaxmi’s sense of dressing, but could have been a little understated. By the way it is virtually impossible to make Golgappas. A Tikki would have been more logical..and so on. Lastly on these counts , I think English Vinglish was a much beautiful film. The conflict was stronger and Sridevi cracked it big time. I must confess that I have very little understanding of films..and please pardon if you find these thoughts too amateurish.